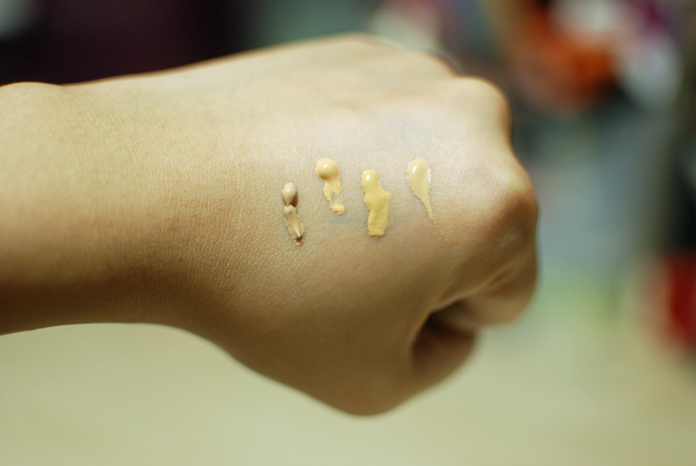 After I posted about the Ahava Liquid Foundation, fairytalesandcoffee asked me to do a swatch comparison with my other liquid foundations. I said OK because it’s fairly different from the other liquid foundations I have. 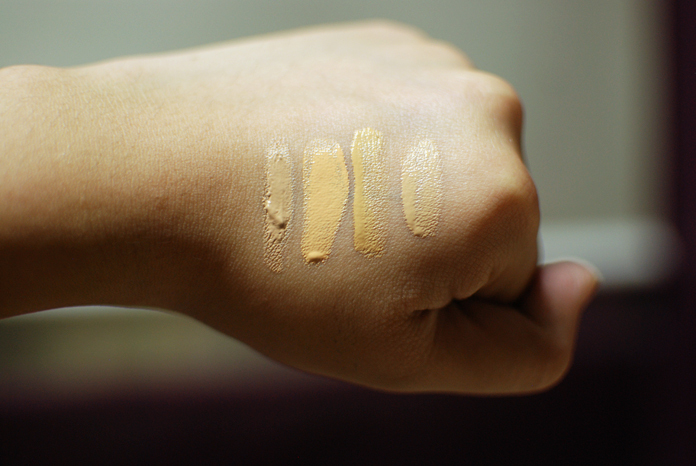 Here are four types of foundation I own, since I have the L’Oreal Lucent Magique Liquid Foundation* in two shades, and strictly that. I didn’t include BB creams or tinted moisturizers, etc. From left to right, they are Ahava Light Foundation in Sand, Benefit Hello Flawless Oxygen Wow in Cheers to me Champagne, L’Oreal Lucent Magique Foundation in G4 (I also have N5), and Bourjois Healthy Mix Serum, which is technically a “gel” foundation, but I found the consistency to be similar to my other liquid foundations. 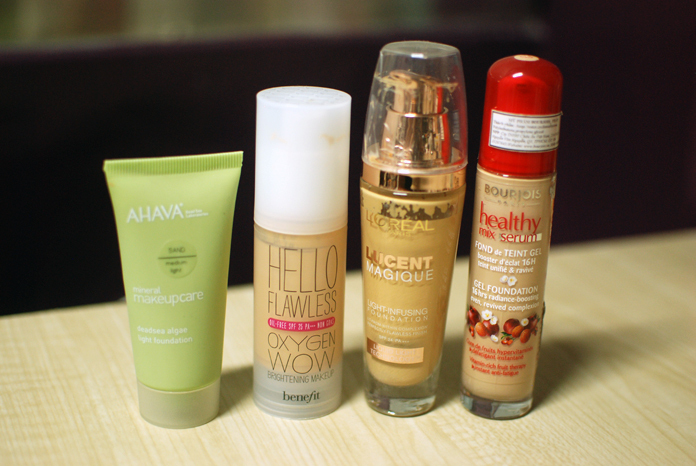 I quite like all of the foundations, though the L’Oreal and Benefit emphasizes my nose pores/blackheads the most. The Bourjois Healthy Mix Serum tends to make my face look powdery when I set it with a powder. I guess that’s to be expected, but the others don’t really react that way. I love the Ahava foundation, though it’s really unpleasant to apply since it seems so thick and heavy. It’s really great after it settles into the skin, though. So there you have it! I am itching to try other cruelty-free foundations and tinted moisturizers, but they’re the type of product that I can’t buy a lot of without finishing (or trying to finish) what I have. What are your favorite liquid foundations? * I received the L’Oreal Lucent Magique Foundation from an event. All of these companies, except for Ahava, test on animals. I’m a big fan of the Illamasqua’s Skin Base (great color selection, too!) and the Make Up Forever HD foundations. But I also do need the medium to heavy coverage. I do like the Benefit HFOW too, especially if I’m doing work on people with great skin to begin with. Ugh, I really want to try Illamasqua’s bases! 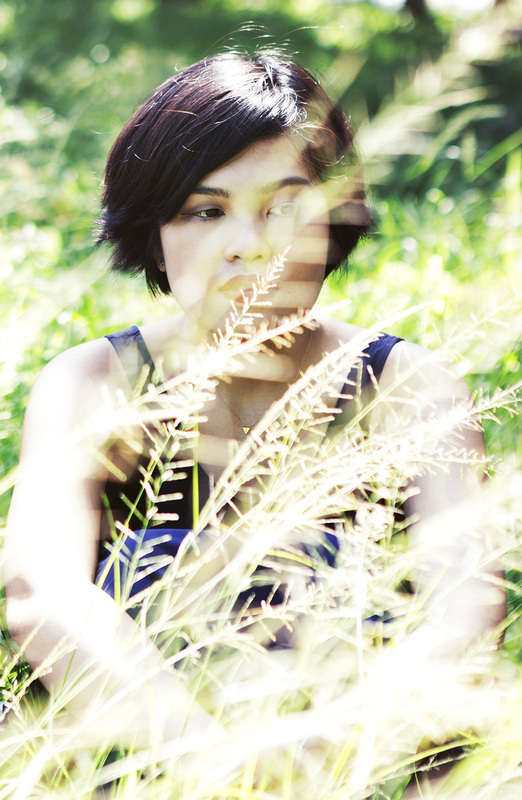 I use my Bobbi Brown Long Wear Foundation for my photoshoots, and they turn out beautiful. There are lots of complaints online that it doesn’t settle very well into the skin, but I’ve always found the finish to be quite natural. That’s awesome, I wish I could have tried it! Ooooh I’m curious about the Benefit Hello Flawless foundation. How does it fare in our weather? Does it last long? It’s alright! Not particularly long-wearing as the coverage is so light to begin with. But it’s good if you don’t want a heavy foundation, not for if you want a heavy-duty one. I wonder which foundation lasts longer? On the face? I’d say the Ahava then the Bourjois. I haven’t been using liquid foundation a lot during the summer (hello bareMinerals), but in the spring, I really liked the Revlon ColorStay Foundation. Revlon is a little sketchy in terms of their animal testing policies though. Sadly, they’re definitely not cruelty-free. They changed their policy once china required animal testing. It’s so frustrating. Yay for bareMinerals though; it’s what I’ve been favoring as well. And yes, I received your email, thanks so much! Where did you buy the Bourjois foundation? I’ve been wanting to try it! There are so many foundations I want to try like the Gorgio Armani Luminous Silk, Kevin Aucoin, and the Hourglass Immaculate one! They all have wonderful reviews. I wish someone brings Sephora here! !